Halifax will be transformed into a food lover’s fantasy with the arrival of the town’s eighth annual Food and Drink Festival. 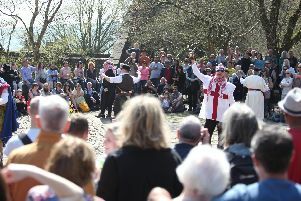 Delivered by the team at Marketing Halifax and supported by Calderdale Council, Borough Market and The Woolshops, the festival will take place on Saturday, June 20, and Sunday, June 21. Richard Waldh and Calderdalke College students Bradley Dixon, Heidi Hirst, Benjamin Lee and Kyle Ball prepare for the Halifax Food Festival. The weekend will offer a live demonstration kitchen with chefs and local producers taking to the stage, around 100 exhibiting stall holders selling homemade food and drink and a homegrown Farmer’s Market. Pictured are students from Calderdale College cooking up a storm in the kitchen in preparation for the festival.